Man, this book is right up my alley. More than that, this book has backed up my alley, unpacked, and moved into my house. The book in question is Weird Detectives: Recent Investigations, a fat anthology of modern fantasy reprints (nothing older than 2004) edited by Paula Guran, focusing on the new generation of occult detectives and paranormal investigators. We love occult detectives at Black Gate — witness all the recent attention to the classics of the genre, including Josh Reynolds’s encyclopedic Nightmare Men series, William Hope Hodgson’s Carnacki The Ghost Finder, the short fiction of Joseph Payne Brennan, Manly Wade Wellman’s Complete John Thunstone and Silver John stories, and many, many others. Ghosts appear to Harry Escott in Fitz-James O’Brien’s short story “The Pot of Tulips,” published in Harper’s New Monthly Magazine of November 1855… In 1859 Escott appeared again (in O’Brien’s “What Was It? A Mystery,” also published in Harper’s) and is attacked by a supernatural entity that is, itself, the mystery. The occult detective had been born. Also known as psychic detectives or ghost hunters, they were more often portrayed as scientists or learned doctors than as true detectives. Rather than dealing with human crimes, these investigators were involved in cases dealing with ghosts, malevolent spirits, arcane curses, demons, monsters, and other supernatural events and entities… A number of these sleuths made appearances in late nineteenth and early twentieth century fiction. Guran references Joseph Sheridan Le Fanu’s Dr. Martin Hesselius (often cited as the first true occult detective), Stoker’s Van Helsing, Algernon Blackwood’s Dr. John Silence, Carnacki, Aylmer Vance, and Dr. Jules de Grandin. Guran collects nearly two-dozen stories to compile what appears to be a fairly thorough survey of the best modern occult detectives — including more than a few featured in popular novels, like Jim Butcher’s Harry Dresden, Tanya Huff’s Tony Foster, Charlaine Harris’s Dahlia Lynley-Chivers (from the Sookie/True Blood books), Carrie Vaughn’s Jesi Hardi (the Kitty Norville novels), and many others. Paranormal investigators. Occult detectives. Ghost hunters. Monster fighters. Humans who unravel uncanny crimes and solve psychic puzzles; sleuths with supernatural powers of their own who provide services far beyond those normal gumshoes, shamuses, and Sherlocks can. When vampires, werewolves, and things that go “bump” in the night are part of your world, criminals can be as inhuman as the crimes they commit, and magic can seep into the mundane – those who solve the mysteries, bring justice, or even save the world itself, might utter spells, wield wands as well as firearms, or simply use their powers of deduction. Some of the best tales of the last decade from top authors of the 21st century’s most popular genres take you down mean streets and into strange crime scenes in this fantastic compilation. And here’s the complete contents. 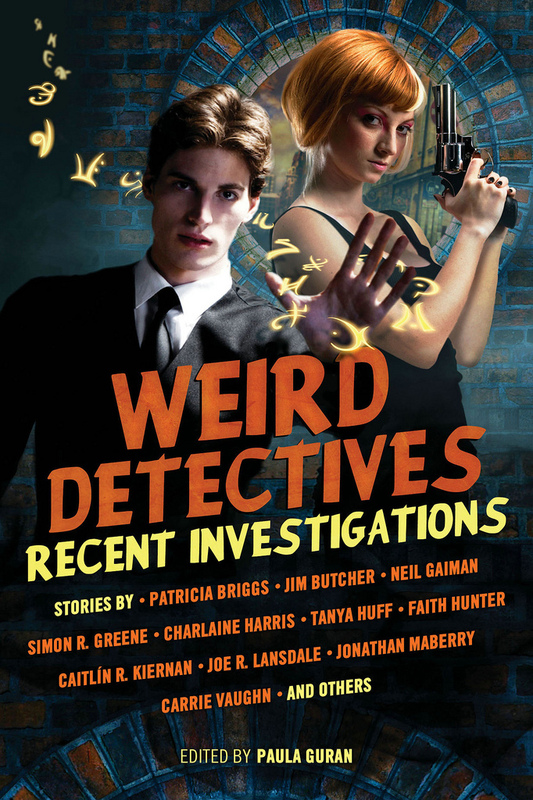 Weird Detectives was published March 19, 2013 by Prime Books. It is 477 pages, priced at $16.99 in trade paperback, and just $6.99 for the digital edition. See all of our recent New Treasures here. I struggled with the Carnacki stories. Just didn’t like them much. I am much more a fan of Hesketh Prichard (and mother)’s Flaxman Low, an under-appreciated occult detective from the same era. I must admit I’ve never heard of Flaxman Low, but you’ve certainly got me intrigued. Are there any (reasonably) accessible reprints I could lay hands on?